Soar by Joan Bauer. Viking, New York, NY 2016. Middle Grade, 297 pages. Jeremiah was left in the snack room of a Computer firm. He was in his baby chair with a half filled bottle, clutching a stuffed eagle. Walt found him with a note: “pleez tek car of him. Bcaz he my best booy. I no yur good!” He was about nine months old. Jeremiah had a rough start in life, but he’s convinced his mother really cared about him. His bottle, after all, was not empty—and she knew Walt would be the first one in on that morning to make coffee—and that Walt would take good care of him. And about that stuffed eagle? Walt does indeed adopt Jeremiah and spends his time reading computer magazines and watching baseball with his young child. Jeremiah may have had a rough start in life, but it gets rougher. In third grade, he needs a heart transplant. This means he will probably never be able to play baseball, a sport he’s obsessed with. Now, just three years later, Walt gets a consulting job in a place called Hillcrest, Ohio. Jeremiah discovers that tomorrow’s baseball stars are playing on the Hillcrest Hornets high school team and he’s immediately excited about the move. Hillcrest is a long way from St. Louis, where they live—and where his doctors are. After making the case to his cardiologist, and a referral to a doctor in Hillcrest, he and Walt get the ok to move. But there’s a dark secret in Hillcrest. And when a boy on the baseball team dies suddenly, baseball comes to a screeching halt in a town where baseball was religion. Even though he is new in town, Jeremiah, with a handful of a few new trusted friends, is determined to revive the sport. Jeremiah is one of the most engaging heroes I’ve read all year. His quirky take on his medical issues is both funny and poignant: he names his cardiac defibrillator Fred and his heart Alice. The eagle he was found with as a baby he names Baby and it becomes a sort of totem (my word) animal for him. He is always optimistic, even when he has to miss an important game to spend a few days in the hospital. Jeremiah says, “It takes time to get used to me.” Well I got more than used to him right away and when I closed the book, wanted to read it all over again. 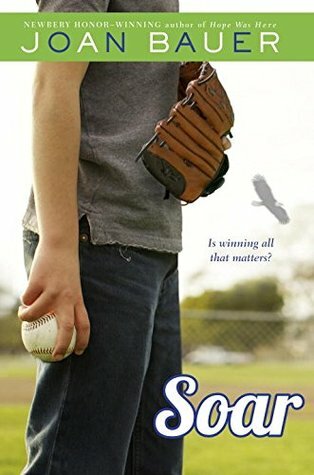 Jeremiah, like an eagle, soars through life and this novel soars with joy, the love of baseball, and an undying optimism that in the end everything will turn out all right. I simply loved it. This book was especially meaningful for me. To find out why, read on. 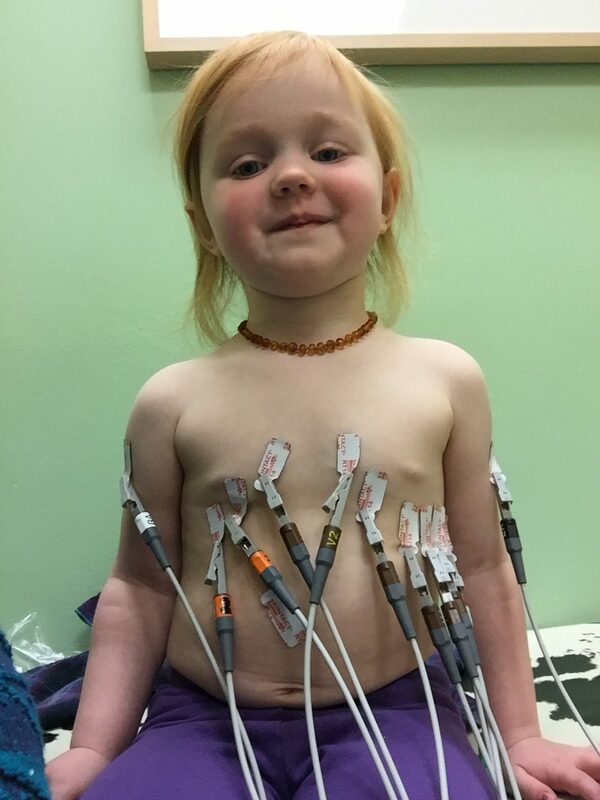 My daughter sends me a photo from the exam room of my three-year-old granddaughter wired up with her EKG. My eyes tear up, but in the picture she shows off the electrodes taped to her chest as if they were medals won in a race. Her proud smile is testament to her parent’s skillful preparation for days like this. She was born gray and not breathing. The diagnosis was a heart defect. More than one, actually. I won’t go into their names or details. Suffice it to say that, like Jeremy, she had a rough start. In the NICU, one of the nurses commented, “We are cautiously optimistic.” Her papa took great offense at that comment. Of course she’s going to make it. What are you talking about? I was terrified for a long time, almost immobilized. But my daughter and her husband were those heroes I mentioned above. They stood by her isolate and later her crib when she was re-admitted, her Papa whispering, “Don’t cry baby girl” when nurses or doctors visited some new horror on her tiny body. Mama held vigil, making sure her girl received that nourishing mama’s milk her little body needed. But today there is good news. She won’t need surgery for another year. As with all her cardio visits, she gets to pick out a toy from the hospital gift shop. She’s tired out now. “I want to go home.” She’s had enough. Have a good nap, sweet girl. You’re a hero too. Love you. You are my new hero. I pray your precious little granddaughter is blessed with a long and healthy life. Thank you so much, Gayle. Everyone has sent such kind words. I put the book on my to-read list. I also put your granddaughter in my heart.